Jae’s Greatest Hits: Top 12 DAY6 Jae Tweets – Sweet Sweet Kpop | News, Games, Giveaways and more! You might know Jae Park as the musically talented, passionate vocal, rapper, and guitarist of the K-band, DAY6. You might also know him as the tall, lanky, slightly awkward, but equal parts relatable guy from Twitter or YouTube. 1. What is Jae without some ironic dabbing? An internet meme as well as a relatable artist, Jae Park connects to his fans and the youth through aggressive dabbing. 2. Oh, the struggles of a man too beautiful for his own good! Only Jae would know the adversities that come with being DAY6’s self-proclaimed visual. After all, they say beauty is pain. 3. The time everyone found out that Jae was an ASMR listener. Nothing like winding down after a long week with some Gordon Ramsay ASMR to help you drift into dreamland. 4. Jae knows the struggles of a blossoming YouTuber. The struggle of being a full-time musician, part-time YouTuber. 5. We don’t know either. Where’s the context, Jae? Is this, perhaps, a spin off of the short-lived meme, ‘he boot too big for his feet?’ Or, is he just talking about Naruto? 6. The time Jae replied to Michael from the band, 5 Seconds of Summer. 7. Jae defines what love means to him. What is greater than the feeling of love between two people? Fortnite. Jae has his priorities straight. 8. Has Jae gone more than 24 hours without picking on his ASC co-hosts? We know it’s true, Jae. 9. Jae exposes his texts with his friends, too. Don’t think you and your friends are the only ones roasting each other on group chats and exposing them on the internet. Jae’s human, too. 10. He isn’t afraid to admit weakness. There’s some real motivation to focus on school. But, let’s be real. Even when we’re doing homework, we’re listening to DAY6. 12. Finally, some good advice to live by. Behind this extroverted and humorous exterior lies a sensible, emotional young man with nothing but good intentions for the world. If you want to experience Jae’s charisma and liveliness right in front of your eyes, you can! Come and see Jae and the rest of DAY6 live on the North American leg of their ‘Youth’ tour. Their energy on stage and passion for their music will surely get you up and moving. 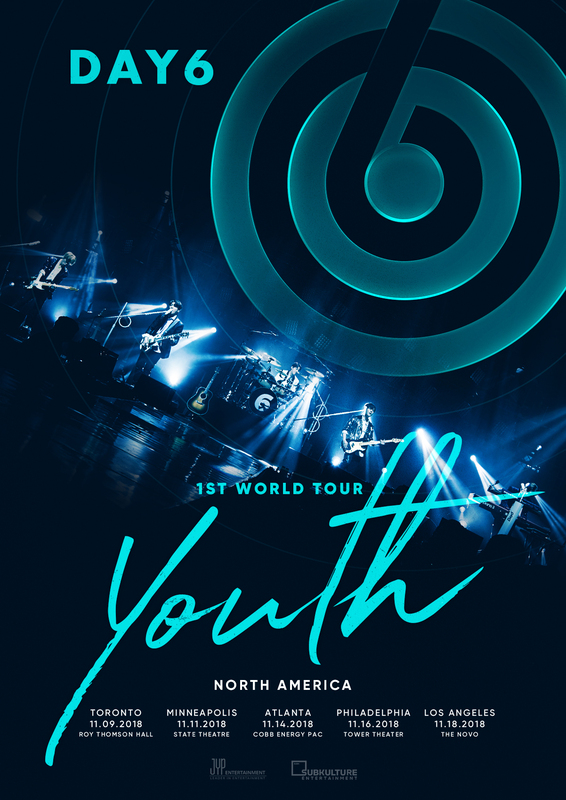 Treat yourself and get your tickets to DAY6’s 1st World Tour!. DAY6 will be coming to five cities in North America. Check the poster below to see if DAY6 is going to be in a city near you. Tickets can be purchased on Ticketmaster and AXS!